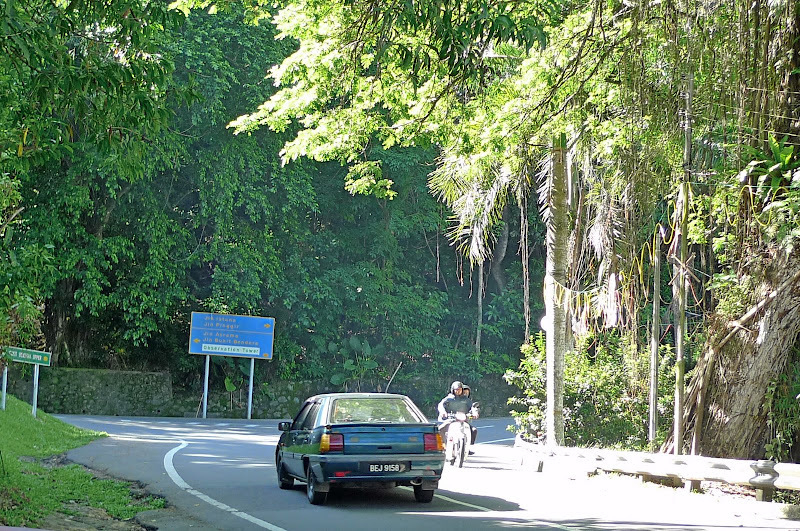 On my 3rd day in Kota Kinabalu (KK), I went for the Klias Wetland Cruise to see the proboscis monkeys as you all already knew if you have read my last post. Since the tour only started at 1pm, I had the whole morning free! Determined not to waste that few hours time, I decided to visit some of the more famous landmarks in KK. So which landmarks did I visit? Well, I visited the two Towers. One was the famous Signal Hill Observatory Tower and the other was the historical Atkinson Clock Tower. I started out early with a map in hand. 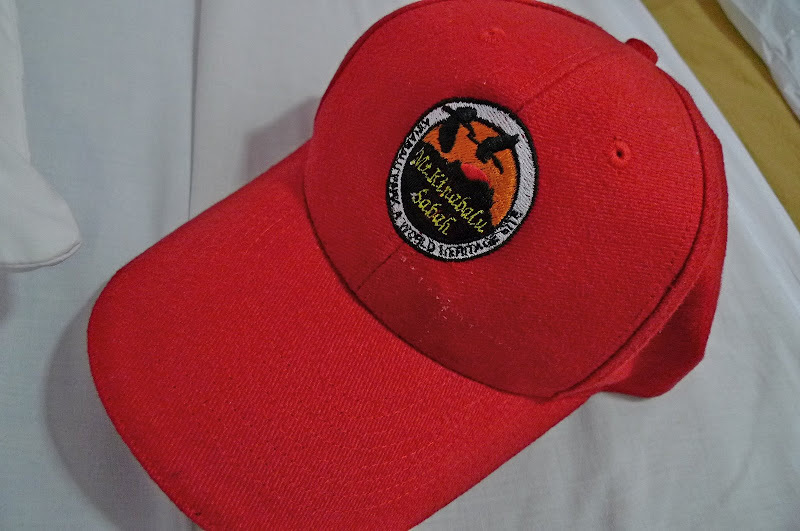 And since the sun was hot, I put on this cap which I bought at a souvenir shop. 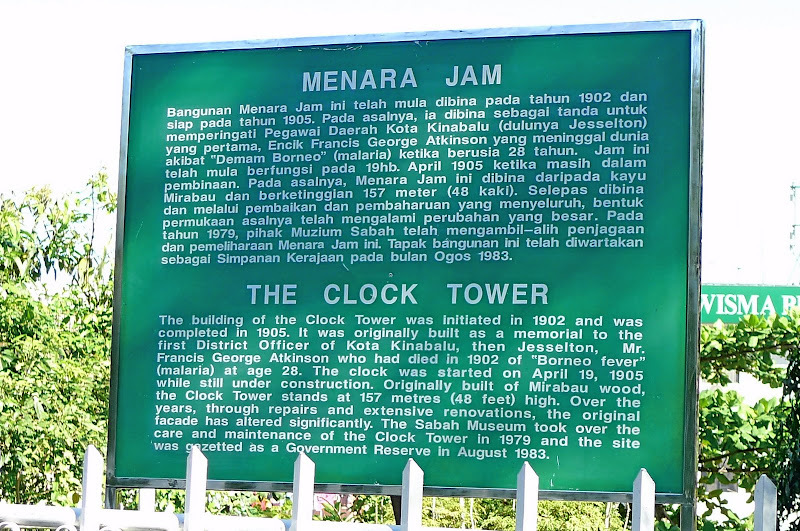 After a 15 minutes walk, I reached Jalan Istana which according to the map, would lead to the Clock Tower and the Observatory Tower. Walking along Jalan Istana reminded me of that quiet road in KL leading up to KL Tower. Same kind of ambience. To my right, I could see the KK's famous Padang Merdeka (Town Field). 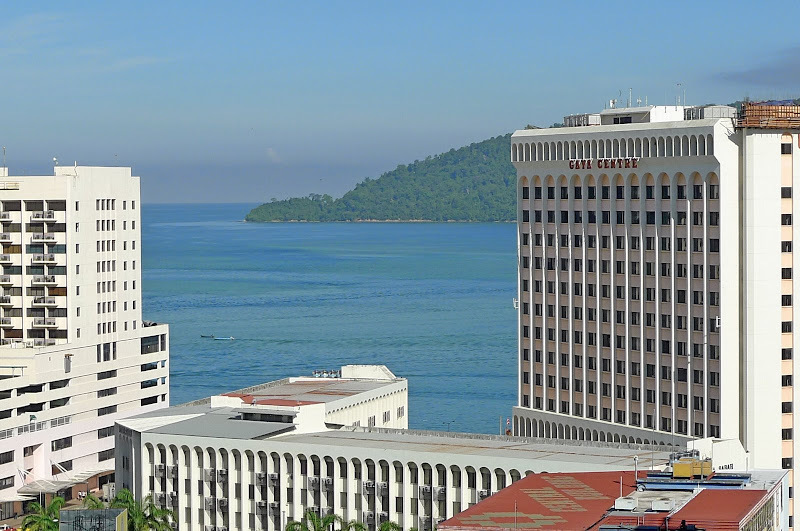 This is the site where the declaration of Sabah's independence and the formation of Malaysia took place in 1963. 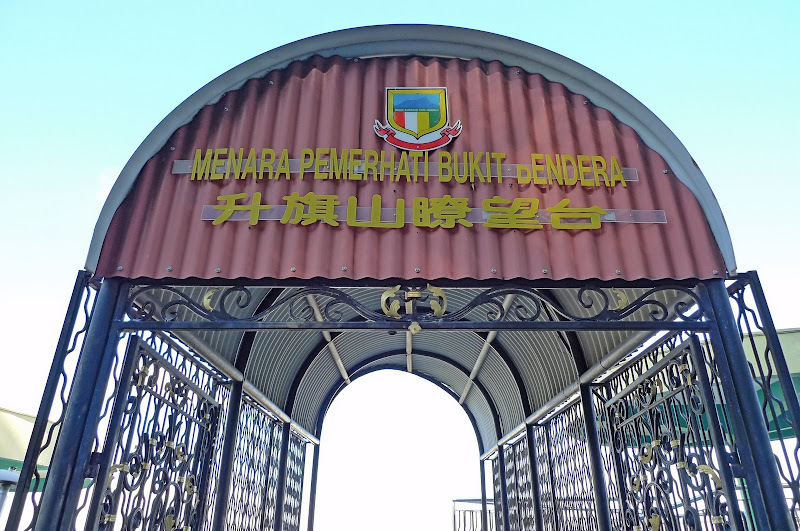 Today, Padang Merdeka is used to host the annual City Day celebration on 2nd February and Merdeka (Independence) celebration on 31st August. Reaching a junction, I took a left turn into Jalan Bukit Bendera. There were many cars that zoomed past me as I walked up the road. I think I must have passed the Atkinson Clock Tower on my way up because according to the map, it should not be too far from where I was. 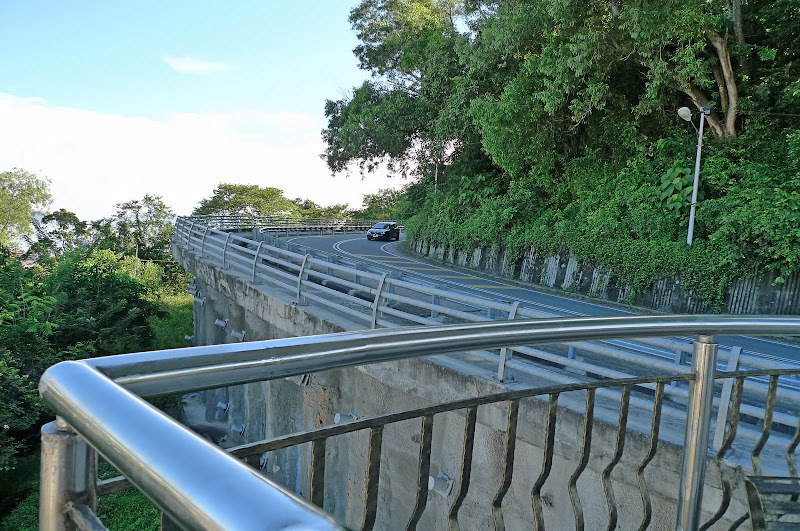 Anyway, I snapped a photo of the Bukit Bendera (or Signal Hill) road going up the hill. After walking for about 15 minutes, I saw two UFO-shaped structures. I must have reached the Signal Hill Observatory Tower. Reading the words on top of the entrance gate confirmed that I was correct. Although, they should have placed English words there too, don't you think? There was no one around! No tourists, no locals. So much for being known as one of KK's famous landmarks and tourist attractions! Or maybe because it was an early weekday morning. Perhaps there would be people coming here during weekends. Standing under one of the UFO shelters, I snapped these photos. 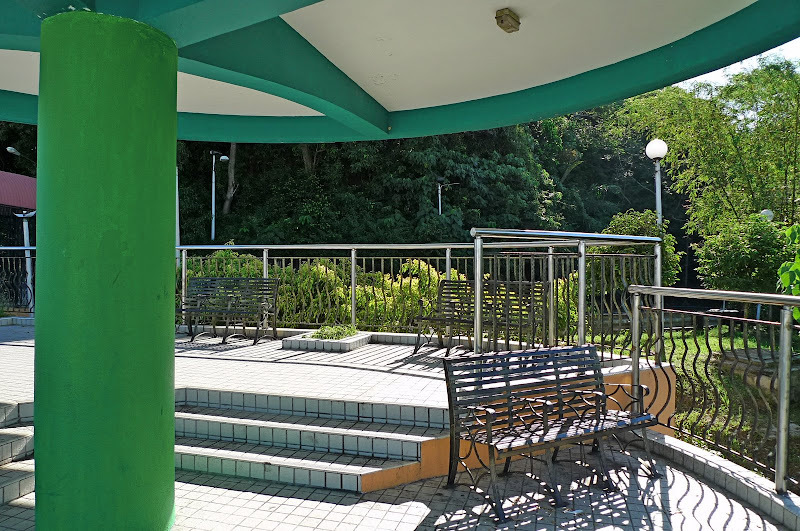 From this Observatory Tower, I had quite a good bird's eye view of the town of KK and even the South China Sea! You could see the Gaya Centre building from here with the sea and the Gaya Island (if I am not mistaken) behind it. 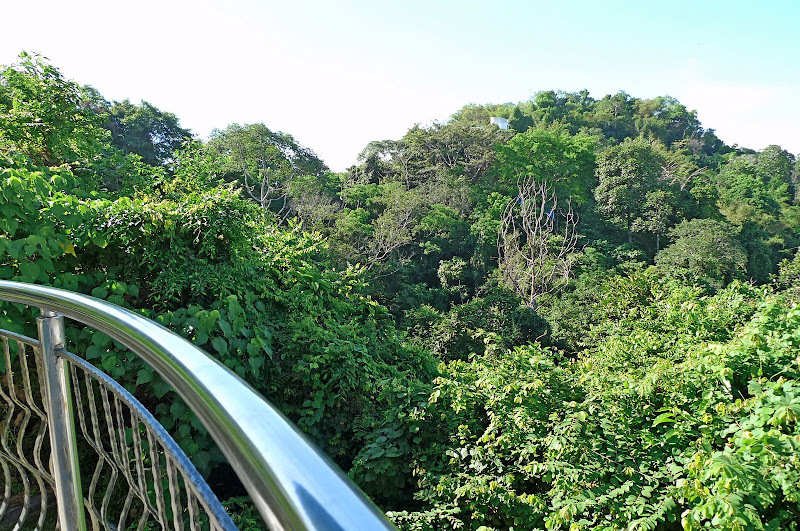 At the other side of the Observatory Tower were views of green forests covering part of Bukit Bendera. After seeing enough, I decided to make my move. 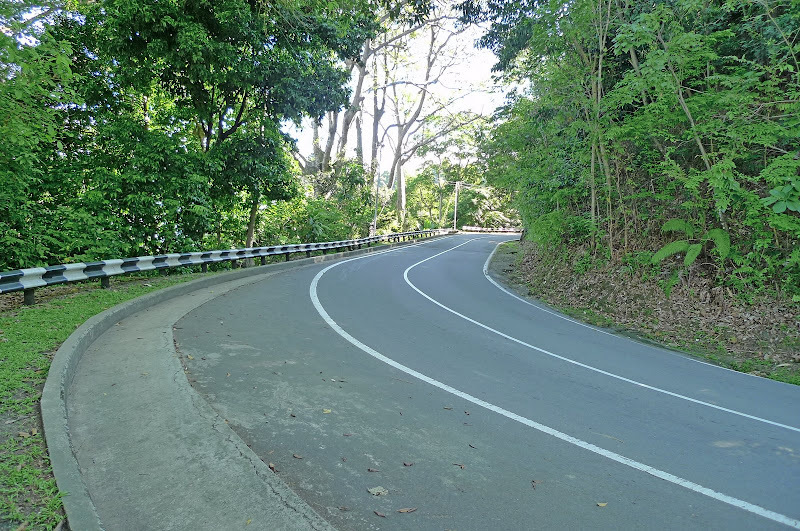 As I left, I could not help wondering where the road uphill leads to. But I did not intend to walk up the road to find out as I was more interested in the Atkinson Clock Tower. Walking back the way I came, I soon reached the Clock Tower. This time, I made sure I did not miss it. It was quite difficult to see the clock tower from the road where I walked as it faces the main road, but luckily, I managed to spot it. It seems that there is quite an interesting history behind this clock. You may read about it from this signboard that was placed there. Click onto this photo to enlarge it for easier reading. Interestingly, this Clock Tower was previously used as a navigation aid for ships for many decades until taller buidings started sprouting around and blocking the view of the clock tower from the sea. 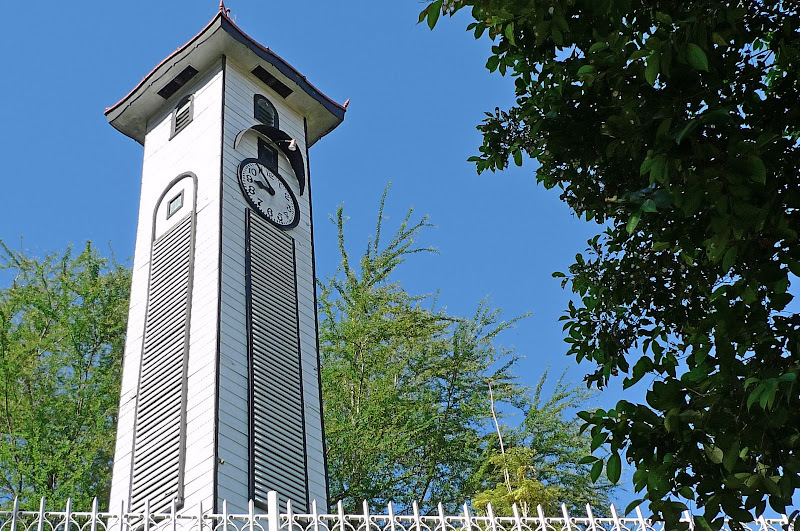 Having survived the air raids in World War 2, it remains the oldest standing structure in KK. I am glad I was able to visit these two landmarks in KK. No doubt, they were not on the priority list of places to visit among tourists, and you may even skip them if you have a very tight schedule. However, as a first timer to KK, I really think it is worth-while visiting these two places. As I walked down the road leaving the Atkinson Clock Tower, it seemed to bade me farewell with the sound of its chime. I counted. It chimed 9 times. I was leaving Signal Hill at exactly 9am. 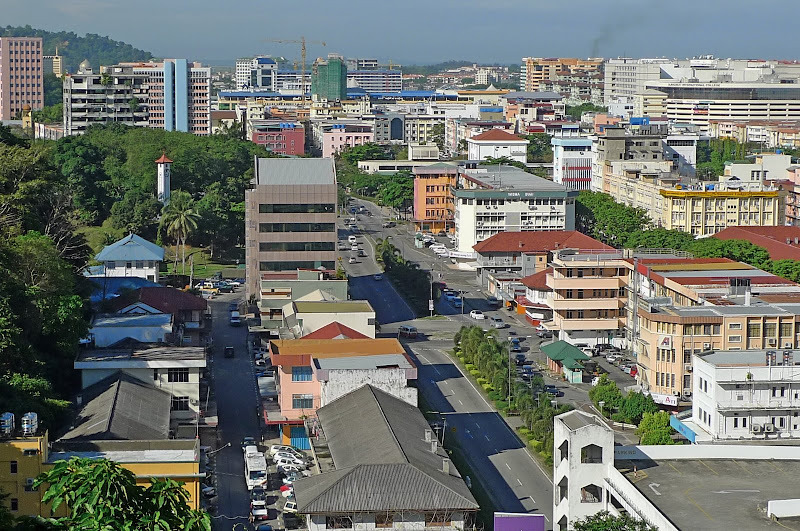 Nice view of KK town from the observation tower. The Padang brings back familiar memories of my last trip a couple of years ago. Well..you've ventured to the off beaten track since not many tourists / locals mingle there. It's good to visit places where others don't...sometimes, you see another side missed out by others. 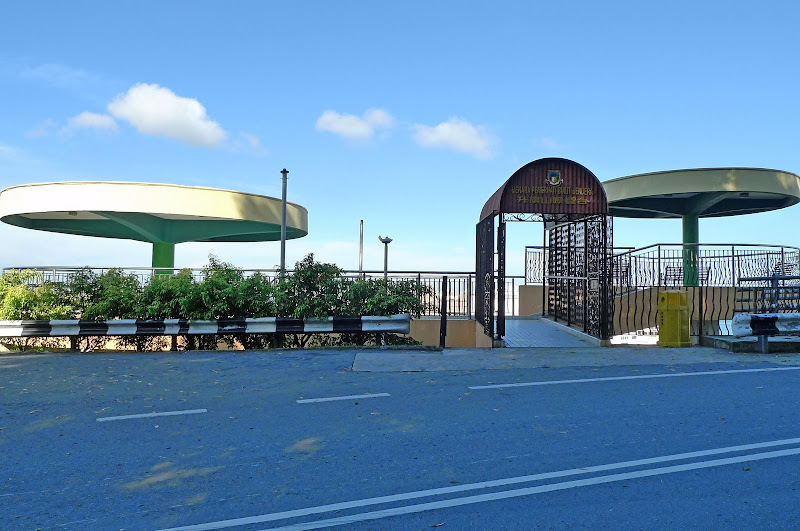 So the observatory tower is a waste of taxpayers' money? che-cheh, you don't? I guess it's not that popular on the tourists' map! But it is mentioned in KK's tourism brochures. I think also mentioned in Lonely Planet. Why no tourists at these landmarks? I guess there are other far more interesting places to go. 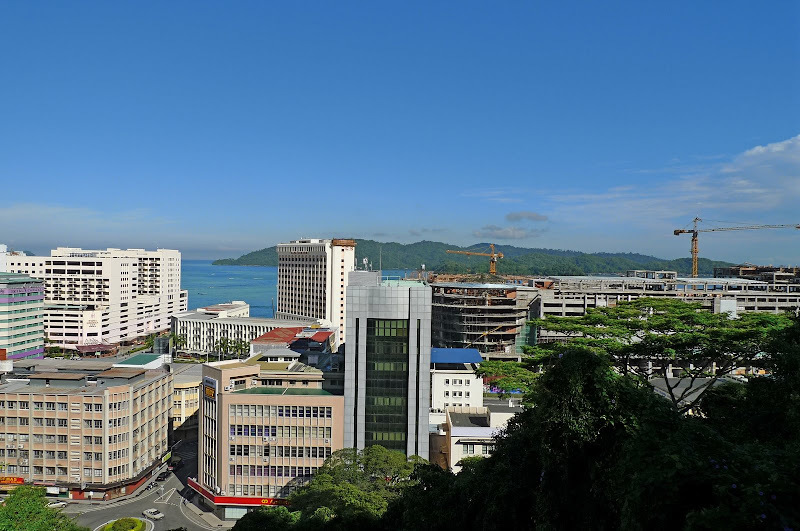 Would you rather go Kinabalu Park or one of those islands near KK or visit these two towers? Haha! khengsiong, not sure if it's really a waste of taxpayers' money. Maybe there are locals who go lepak there during the evening to see the sunset? Or perhaps tourists go there in the evening? Not sure if they have parade in Padang Merdeka on Sept 16. Any readers from KK who can answer this? Hmmm, I notice not many bloggers from KK - in fact, I know of no blogger from KK. I cannot believe it was so deserted! Beautiful view though and I love looking at your pics! Wow! You really can walk! Hehe. hey.. did you plan this trip by your own? it seems very organized to me coz you know all the 'strategic' places in KK.. im sure you did a research before you travel there right? now i know bout KK sooo much! thanx to u.. i've never been there. hmm.. dunno if i'll ever get there! looking forward to see wat is a tarap fruit though.. hehehe..
That's a pretty (and very British) clock tower and a memorable name to go with it. At least there is history there unlike most clock towers that are just called "(City name's) clock tower". Eh? 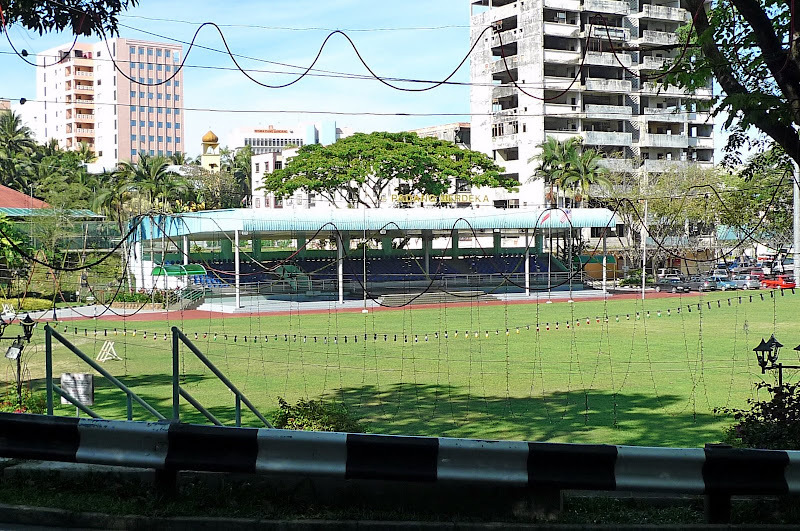 Great picture of the padang - quite like those found in school textbooks. LOL! And oh.... nice red cap. One for the souvenir shelf. 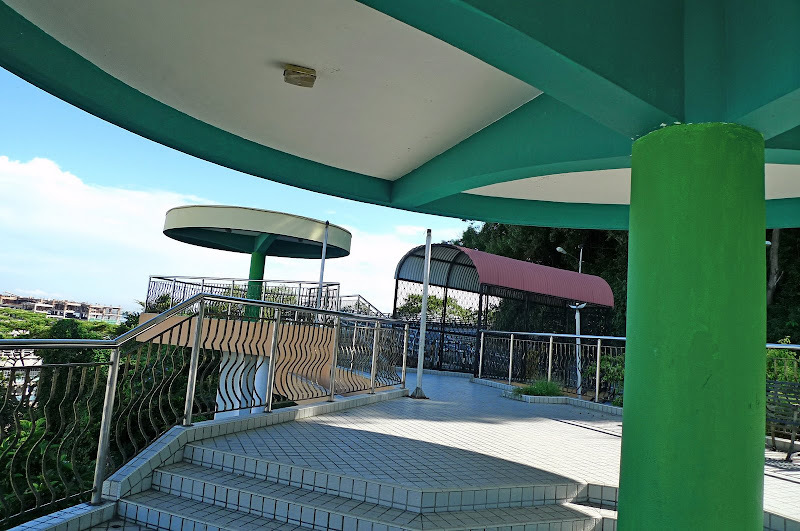 Nice photos foong, you're right about the observatory it should have an english translation. Mei is always too early! I also agree about going out earlier so no hustle with picture taking. I can snap as much as i want without distractions. 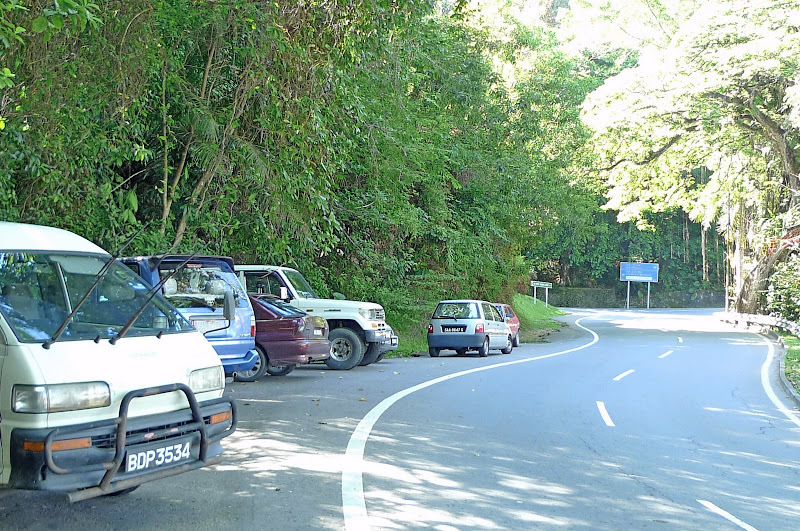 Other than the monkeys and Mt Kina, the place has not much else interesting to offer hor? the view is nice. Hmm... how come I haven't heard of the tower?!! So jakun la me..
superman, I can walk and you can fly! LOL! kenwooi, yes I planned it on my own with the help from blogs, websites and Lonely Planet. Your impression towards KK has changed just from reading my blog? Wow! I'll take that as a compliment! Thanks!! happysurfer, yeah nice clock tower with a nice name! Haha! ayie, you agree don't you? English speaking tourists would not know it's an observation tower without any English information although they can guess, I suppose. Mei Teng is always early - she's an early bird. Well, the early bird always catches the worm, right? Haha! neo, well it's about time! But be warned of the high entrance fee - I think it's RM38 if not mistaken! the environment looks so peaceful, quiet and serene. 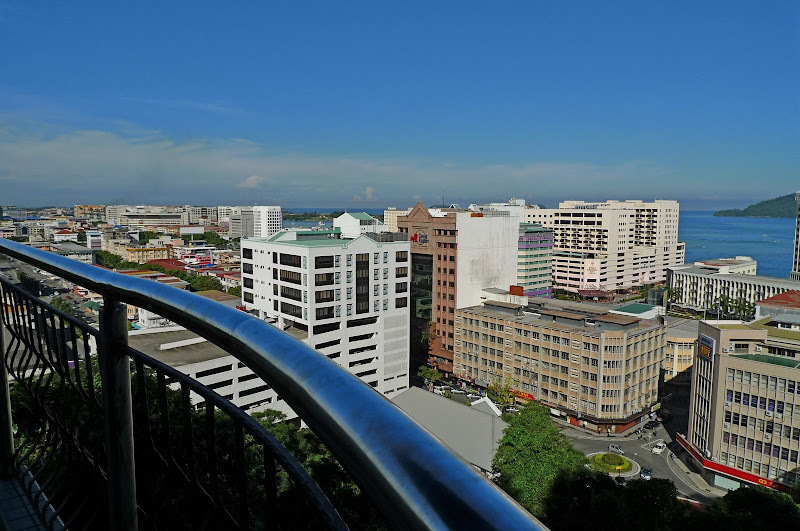 The tower is great for glimpses of the city skyline. Hi Foong! Visit you back here. I enjoy reading your adventures. It's as if I'm tagging along with you. ha ha ha! Thanks for sharing those wonderful places. I wish I could visit them too. Btw, I only have this two blogs. And you're up on these blogs. Wow this two towers is better than LOTR :P. Though it seems like the sunny side of KL is everywhere! I would supposed it was early in the morning since you mentioned you left at 9am sharp and the sun was already so bright and sunny! I guess one reason there aren't many people there was due to the high entrance fee. LOL. Two Towers, corny but worked. never heard of any of those though. you were right, not on tourists' priority list. but a good find nonetheless. Nice pictures of the town you took from the highland! Very clear! War...the 2 towers? How come not the same from LOTR? ha :D War...mei ting can really relate huh! You'd even been into the UFOs? Anyway nice snaps. :D Hopefully I can go KK too. the two towers pc game free?" Ive been searching all the day long with no results. And dont say like "buy the game, its more ligal etc. you would like to find another Lord of the rings game or any other game for that matter just request it on Jeugo Forums.